I am running for the “Contract Personnel Representative” on the Cowboys Professional Rodeo Association Board of Directors. If you are a “dues paid” member in the “Contract Personnel” membership categories of the CPRA you are eligible to vote for me in this election. These categories include: Secretaries, Timers, Pick-up Men, Bullfighters, Announcers, Contract Acts and Specialty Personnel. 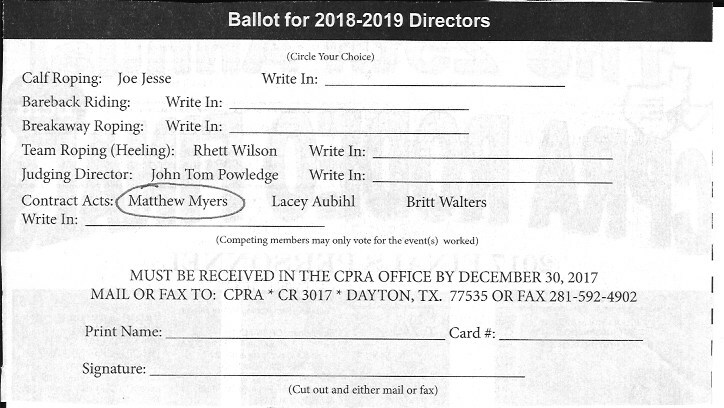 I have attached a .pdf and a .jpeg ballot below that is conveniently filled out so that all you need to do is print, complete and mail or fax to the CPRA office. Please remember that the ballot receipt deadline is December 30, 2017! I am confident that the CPRA is one of the premier regional rodeo associations in the entire country. Furthermore, the health of the CPRA has a direct impact on contestants, contract personnel, stock contractors, host committees and even rodeo fans. Making the CPRA the absolute best it can be is good for EVERYONE and that is my core desire to serve as the Contract Personnel Representative on the CPRA Board of Directors. Being involved in the production side of rodeo for 23 years has blessed me with the opportunity to work in a wide variety of geographic locations with a diverse group of people who have an interest in the success of rodeo. I would be honored to serve my fellow CPRA members, contract personnel AND otherwise on our Board of Directors. Quite simply, I am asking for YOUR VOTE. I am highly accessible by phone and email and would love the opportunity to speak with you as I seek this office. My contact information is in the “About Me” section below-please do not hesitate to call! This entry was posted in CPRA Rodeo and tagged Board of Directors, CPRA. Bookmark the permalink.